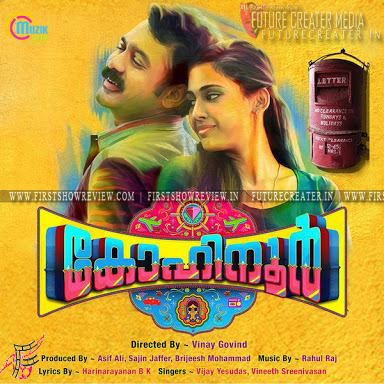 Kohinoor, a pure suspense movie which stars Asif Ali, Indrajith, and Vinay Forrt in the lead roles. The movie is directed by Vinay Govind (Kil Poyi fame) and jointly penned by Salil Menon and Ranjeeth Kamala Shankar. Kohinoor is produced by Asif Ali, Sajin Jaffer and Brijeesh Mohammed under the banner Adam's World Of Imagination. Jeethu Joseph - Dileep team-up “Life Of Josutty” is running without twists and here “Kohinoor” came up with several twists at end point, that steals the show. Louis (Asif Ali) is a happy-go-lucky guy who has a strange admiration for the underworld dons. He is highly fascinated by Mohanlal's character Vincent Gomez from the popular movie Rajavinte Makan, and wants to be a smuggler like the character. Louis's best friend is Aandy Kunju (Aju Varghese). Later, Louis and Aandy meet Haider (Indrajith), who works for Mumbai underworld and Freddy (Vinay Forrt) and Nicholas (Chemban Vinod Jose), who comes from Kochi. The trio has a secret mission and Louis joins them. Meanwhile, Louis falls in love with Daisy (Aparna Vinod), a sales girl. As the movie having a bunch of twists and turns, we not revealing much over here in story side...so just go to theater and feel the value of “Kohinoor”. After a long time, Asif Ali delivers an exuberant performance as Louis; but tends to over-act at some portions, by trying to make his acting and style as more classy like 90’s actors. Aju Varghese, who appears as Aandy Kunju, is at his usual best. Vinay Forrt, and Chemban Vinod Jose, who Freddy, and Nicholas are perfect in their roles and makes a great combo. But the real show-stealer of the movie is Indrajith, who plays Haider. The actor stuns with his terrific dialogue delivering skills and extraordinary screen presence. Aparna Vinod, who plays the female lead, is impressive in her minimal role. But the actress lacks an on-screen chemistry with Asif Ali; which badly affects the romantic track. Bhavana, who appears as Louis's ex-girlfriend Lilly, adds an extra flavour of entertainment to the film. The rest of the star cast including Mamukkoya, Saiju Kurup, Sudheer Karamana, Pradeep Kottayam, Bhagath Manuel, Biju Kuttan, Harikrishnan etc are perfect in their roles. The movie is directed by Vinay Govind. It is evident that Vinay has the potential to make the real funny situations in his films; but he somewhere loses the control over the movie in first half and later it get back into a worthy watchable. Pradheesh M Varma's cinematography has played an instrumental role in making an original ambience for the movie, which revolves around the 80's period. Arju Ben handles the editing, it is perfect. Ajay Mangad, who handled the art direction and Sameera Saneesh, who designed the costumes deserves a special mention. Songs and Background score are composed by Rahul Raj. BK Hari Narayanan pens the lyrics. The song Hemanthamen provides the real nostalgic feeling; while Dum Dum Dum turns out to be an interesting fast number. The right mixture of suspense, humour, thrill, nostalgia an over flowing twists and turns.